If you’re unfamiliar with the movement, “Fernandomania” was a craze roughly similar to the one that baseball fans experienced this past season in relation to Washington Nationals phenom Stephen Strasburg, albeit with several significant differences: (1) Fernando Valenzuela made a mostly anonymous debut prior to his official rookie campaign, whereas Strasburg made a highly-anticipated debut as a mid-season call-up; (2) Valenzuela dominated throughout the 1981 season en route to Rookie of the Year and Cy Young honors, whereas Strasburg lasted 12 starts in 2010 before his rookie year was cut short by injury; (3) Valenzuela joined a Dodgers team that wound up winning the 1981 World Series, whereas Strasburg joined a pitiful Nationals team that finished last in the National League East (again) and called it progress; and (4) Valenzuela was signed by the Dodgers to attract a very specific kind of fan, whereas Strasburg was signed by the Nats to attract any ticket-buyer whatsoever. Of all those differences, it’s that last point that’s most noteworthy, because while it’s easy to assume that the Dodgers have always had a sizable Hispanic fan base, given the large Mexican-American population in and around L.A., Fernando Nation proves otherwise: Before the Dodgers attracted Mexican-American fans, it displaced them – bulldozing their community of modest homes in Chavez Ravine so that Dodger Stadium could be erected there instead. The very franchise that broke the color barrier years earlier by signing Jackie Robinson inspired Mexican-Americans to band together to “Remember Chavez Ravine.” And remember they did. Until Fernando helped them move on. 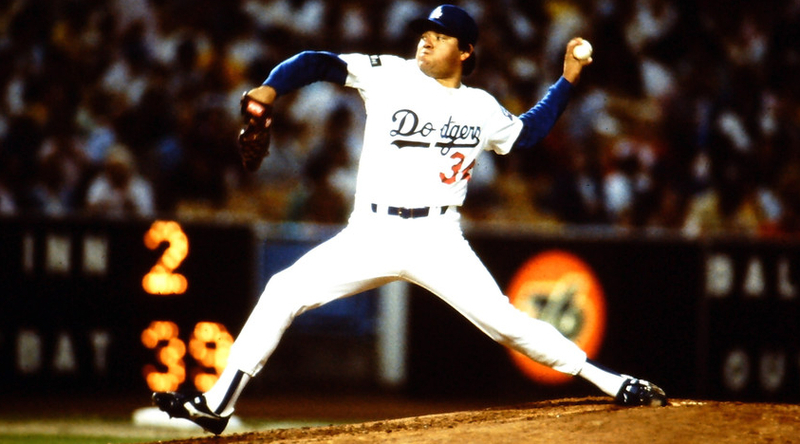 It would be overstatement to call the signing of Valenzuela a pure publicity stunt, but Fernando Nation makes it clear that the Dodgers’ ownership at the time (not the McCourts) was more concerned with signing the “Mexican Sandy Koufax” than with signing the second coming of Sandy Koufax. If the Dodgers had missed their chance to sign Valenzuela – who nearly became a Yankee instead – it’s likely they would have signed the next best Mexican pitcher available. And what a mistake that would have been, because no one else could have compared. Valenzuela’s rookie year was the stuff of legend: he wound up pitching on Opening Day due to an injury to the team’s No. 1 starter and he won; he won his first eight games, actually, five of them shutouts, en route to 20 complete games and 21 wins; he won Game 3 of the World Series to help dig the Dodgers out of an 0-2 hole. He was magical – a feeling heightened by his curious habit of looking skyward midway through his windup (famously parodied by Tim Robbins’ Nuke LaLoosh in Bull Durham). Fernando Nation conveys the whirlwind nature of Valenzuela’s breakout season by not just hitting the key milestones but by clicking them off at a breakneck pace, through the calls of Vin Scully, through the memories of Hall of Fame manager Tommy Lasorda, longtime scout Mike Brito and various Dodgers historians, among others. It’s an exhilarating retrospective for a player who was one of a kind. But as enjoyable as it is to see old footage of the young, tubby Valenzuela, rocking back in his trademark delivery, the film’s strength is its sense of context – detailing Valenzuela’s impact at the ticket window and beyond. After all, Fernandomania wasn’t just a sports phenomenon, it was a business phenomenon, and the impact of Valenzuela on the Mexican-American community wasn’t just a win for team spirit, it was a win for the Dodgers franchise that cashed in on his appeal. Eventually, it was also a win for Valenzuela himself. Signed for the league minimum of $32,500 in 1981, he held out the following season until agreeing to a 1-year contract of $350,000. The following year, in arbitration, he won a $1 million salary. Those numbers are paltry by today’s standards, but the ratio between an owner’s personal revenue and his player expenditures hasn't changed all that much. Today’s multi-million-dollar professional athletes are often vilified for holding out for larger contracts, but Valenzuela’s story underlines that it’s a matter of principle far more than it’s a matter of necessity, and rightfully so. Born into hardscrabble conditions in a remote Mexican village where he shared a bed with his brothers, Valenzuela was made (comparatively) wealthy with his first contract. But it took several years until he was paid what he earned. With his success in salary arbitration, not to mention on the mound, there's no question that Valenzuela helped open doors for Hispanic players after him. Yet his rags-to-riches rise from obscurity is timeless in a way that makes his story feel almost stereotypical. It wasn't. As dominating as Strasburg was in his limited season, even he didn’t shut down teams like Valenzuela did in '81 (more strikeouts, yes; more runs, too). And as tempting as it is to look at Cincinnati Reds fire-baller Aroldis Chapman and wonder if he might replicate Valenzuela’s feats next season, it’s sobering to think of just how dominating he’d have to be on the field and just how impactful he’d have to be at the ticket window in order to compare. Angeles’ film isn’t overly reverential, but it makes it obvious that Fernandomania was truly special. In one of my favorite moments, Angeles captures a modern Valenzuela in the upper deck of Dodger Stadium, looking down at the field and admitting he’s uncomfortable with heights. Those cloud-scraping nose-bleed seats are the ones that Fernandomania routinely filled, often by lower-income Mexican-Americans who so looked up to Valenzuela that they were thrilled to look so far down to watch him pitch. Fernando Nation premieres tonight on ESPN at 8 pm ET, and will rerun frequently thereafter. The Cooler will be reviewing each film in the “30 for 30” series upon its release. See the archive. I remember flat-out refusing to hop on the Fernando Valenzuela bandwagon, disliking him simply because I disliked everything associated with the Dodgers. (It was a lonely year.) Strange, because looking back I find both his pitching style and Tommy Lasorda's spaghetti-o's persona amusing. There hasn't been as entertaining a pitcher on the mound until Lincecum came around. Does the documentary go over how he abruptly flamed out? Regardless, I'm curious enough to possibly take a look at this one. Does the documentary go over how he abruptly flamed out? Yes and no. It alludes to the fact that when Velenzuela lost it, he lost it. But in 50 minutes there isn't much time to focus on too much beyond his arrival. As a Giants fan I had my own reasons for resisting Fernando. I laughed when they showed a clip of him standing at first base with a Dodgers coat that had his name on the back, because it's a tribute to his great hitting that I think of him wearing that coat as much as I think of him on the mound -- dude could hit! This might be a bit off subject, but from Bull Durham to Rain Man, it's also curious to note how he influenced two of the biggest films of the 1980s. Jamie: My two brothers are 12 and 18 years younger than me. (I grew up an only child; then my dad remarried and that led to brothers.) The older one, now in college, is a blossoming movie fan. The younger one isn't; he isn't anti-movie, and often likes the movies he sees, but movies just don't fascinate him. Both of my brothers are huge sports fans. That point of saying all of that is this: As I watch these "30 for 30" movies, I often find myself thinking about my brothers. For people of my generation, these are often trips down memory lane, or they provide color to stories that we kind of knew about that had always felt mired in gray. But for my brothers, these movies are introducing them to people that they might never have heard of. Watching Fernando Nation it struck me that he's one of those guys who was very dominant (at least for a time) who now could so easily be overlooked altogether. Your point about Bull Durham and Rain Man reveals how unforgettable he was to the people who watched him pitch, and yet I wonder if my brothers had even heard of him before (I haven't asked yet). In the grand scheme of things, I'm not sure that it's important for my brothers to know about Valenzuela specifically, but this film shows that it's important to know about his impact -- an impact I wasn't really aware of but that now seems obvious.